In my High school, one of the last departments to realise a use for iPads was the Math department. Note: As a UK born New Zealander, writing Math and not Maths is difficult but as most my readers are american, I’ll persist! Also…. I’m not a Math teacher, so sorry if I upset anyone. Their thinking was that Math had to be hand written and there was no digital functionality beyond a calculator that suited the learning of Mathematical problem solving. Certainly things like movie making, animation and group work did little in the genuine learning of Math reasoning. Plus the age-old excuse that the exam was hand written and so experience was needed and the iPad was only a distraction from this vital practice. The first change came with using the app Explain Everything. This is often a comfortable first step into new pedagogy as it mimics the whiteboard but offers new functionality and workflow. 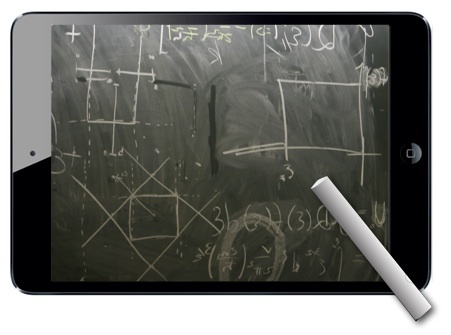 This allows Math teachers to hand write their mathematical working whilst recording the lesson, including their voice. Uploading these skills videos to Youtube saves hours of time in the classroom repeating oneself and allows students to come preprepared or review after a lesson. Either way moving some or all of the standard Math teaching online saves time. After watching Dan’s talk, I realised that Math teaching could be more about students finding their own problems to solve in rather creative ways. Students could be freed from the classroom to challenge each other with videoed problems and limit the information provided. Remember the iPad’s app store can provide apps that just about take any type of measurement and mostly for free (See below). “Best Math App” lists like this one focus on that Math Dan talks about that kids have to learn in school without worrying about why they might need to know it. In my mind, it now becomes less about finding the best Math teaching / learning app and more about building a set of measurement tools for life. These tools can then be used to make Math learning come to life and seem relevant. Easy MeasureThere’s math to be learnt in the way this app works alone! iHandy LevelGreat general carpenter’s tool Measures HDLots a measurement tools in one including Seismic! For most students, this applied Math approach is far more meaningful and fun and can highlight the subjects significant place in their lives. Something that is not always apparent in traditional Math teaching. The ‘real-world’ approach mentioned above could certainly apply to any student from about the age of 8. 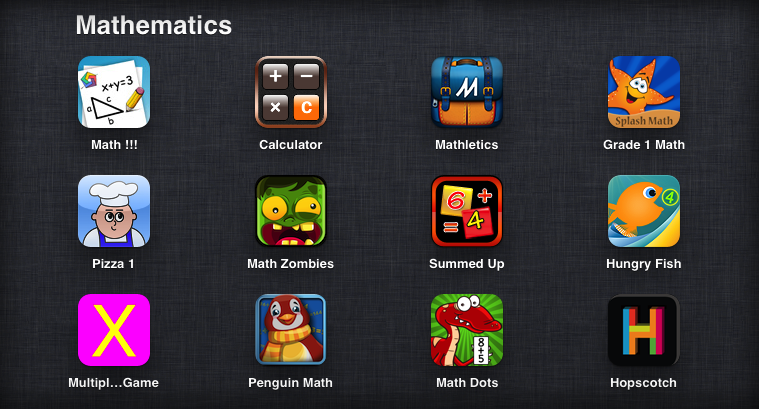 Before that, the library of basic Math and Number apps in the store comes into it’s own! Apps make Math fun from an early age and remove the fear factor whilst giving the all important instant feedback. Nearly all basic Math apps are free and it’s just a matter of trying them out, Start by typing “Math” into the App store but sorting by popularity. Here’s a selection of the most popular. I personally liked the simplicity of “Summed Up” ($0.99) and the animation & game concept in “Hungry Fish”. I included Hopscotch, which is a kids drag and drop programming app as it allows kids to experiment with algorithms in a fun way and try out a lot of Math on the way. 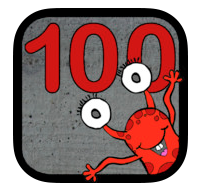 100s Board ($2.99) is ‘simple as’ (as us Aucklanders would say) but in it’s simplicity comes flexibility and a nurturing of children’s natural talent to invent their own games. 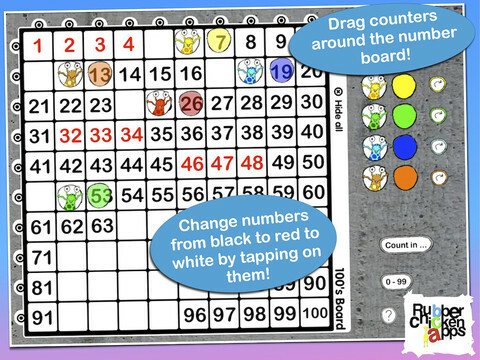 It presents a simple 100s board and will highlight numbers to help young people count in 2s, 3s, 4s etc. It also has coloured & monster counters that you can place on numbers to invent games with. It hides numbers as well as highlights on touch. My 8 year-old immediately started inventing games for my 6 year-old including “Higher-Lower” where in 7 goes, the youngest had to find the chosen number, whilst all prior guesses were highlighted. The face that it’s not a game in itself is actually a bonus as it extends kids’ imagination. Check it out! 100s Board is made by fellow Kiwi @MattJamesThomas. The age and ability of the individual student will decide the best approach, be it applied discovery of Math or more rudimentary game play. Regardless, the iPad has much to offer in Math learning and I hope this helps those Math teachers who weren’t sure where to start.